Christmas seems so close now and there are so many fun things to fit in before the big day! 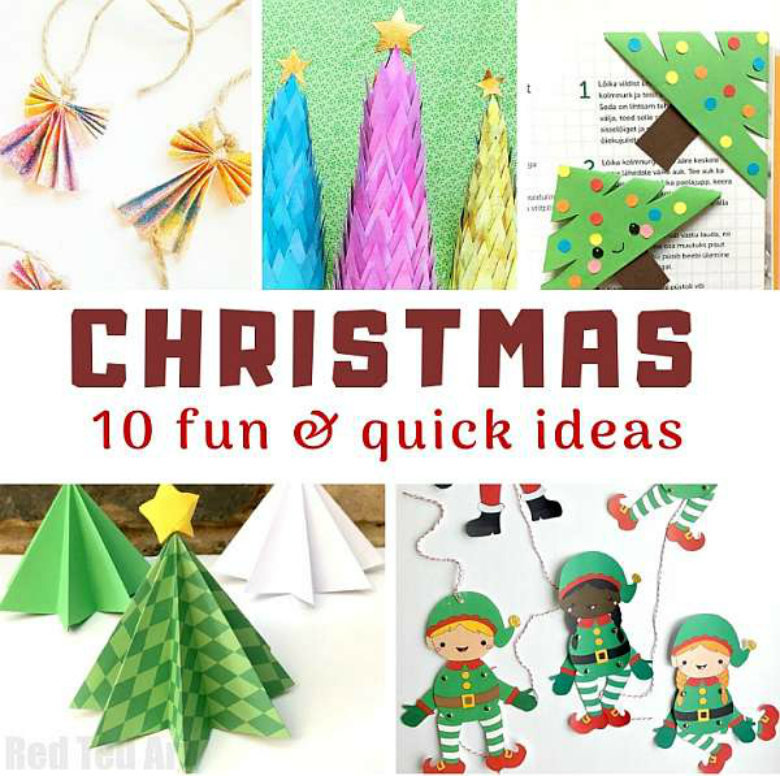 Today we have a list of fun Christmas craft ideas for kids put together by the lovely Maggy from Red Ted Art. She has made a list of some of her favouite kids craft ideas for Christmas. I love that lots of her craft ideas come with free printables that makes them really easy to create with the kids. So over to Maggy! Christmas is one of our favorite holidays, and also an opportunity to spend time with kids crafting! We love to sit together months before Christmas comes and start planning on Christmas gifts to make as well as DIY Christmas ornaments we could prepare for our Christmas tree! How about you? When does *Christmas fever* start in your home? 1. We love giving our friends and family members books as Christmas gifts! You too? Invite kids to create lovely Christmas tree bookmarks and slip them into book corners before wrapping up Christmas present! 2. For little ones, origami can be challenging. 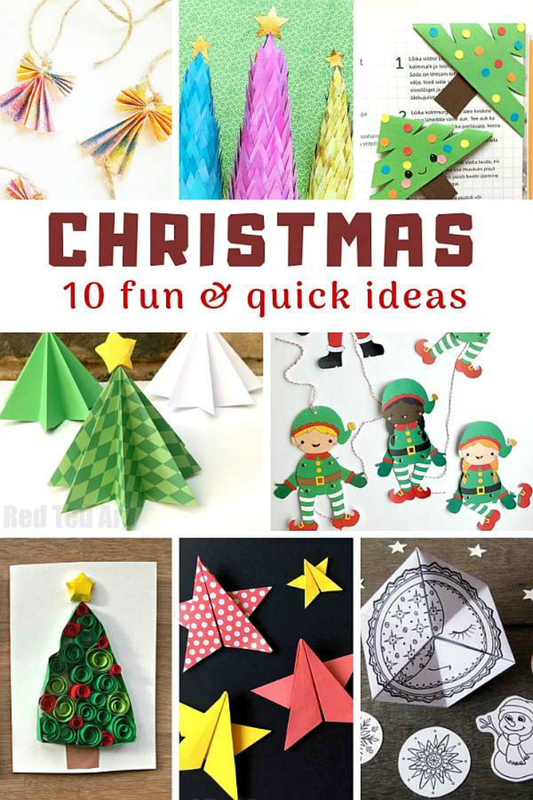 But these origami Christmas trees are so simple to make that they will ask to make lots of them! They look lovely hanging on the trees or used as centerpieces for your Christmas table! 3. Another quick origami craft, perfect for beginners, are origami stars! Just imagine them stringed on the tread to form long Christmas garland! They will look beautiful! Since they are flat, you can also use them to decorate Christmas wrappings or on Christmas cards! 4. My kids love creating their own Christmas cards. We make different designs each year and one of our favorite from past are pop-up Christmas tree cards. They only look hard to make but, they are very quick and easy to craft. 5. Have your kids ever tried quilling? It looks hard but it really isn’t! We love the look of quilled Christmas trees! You can use them on Christmas cards to send to family or friends or as Christmas tags to attach to Christmas gifts under the tree! 6. For kids who love making their own toys, winter flextangles are perfect craft! Print, cut, color and assemble together for play! Easy toy to make and fun to play when done! 7. You probably have some cardboard or cereal boxes laying around the home? Use them to make wonderful cardboard tree decorations and display them in your home over Christmas holidays! 8. When you have toddlers or preschoolers around, they can still create lovely things for Christmas decorating. One of super easy crafts that work wonders for their fine motor skills is torn paper Christmas wreath. 9. We love spending time reading stories before bedtime. And around Christmas, most of the stories revolve around Santa, reindeers and elves! To accompany storytelling time, make these adorable multicultural Santa puppets! 10. Over time, you probably collected many of your child abstract artwork? We have loads of them! Get them out of the storage to create these lovely recycled art ornaments! Always good idea to reuse what you already have in your home! From toys to play with to handmade Christmas Decorations to hang on our Christmas tree, from lovely garlands to decorate our home to Christmas gifts to make and give to friends and family members, kids enjoy Christmas season fully and look forward to Christmas months before it comes around. In our home, we use crafting as one of the ways to bond as family and create lasting memories for years to come. How about you and your family? Do you have family traditions to enjoy year after year?